The omizuya, which is the main preparation room (mizuya), is located in a central position amid the various tearooms of the Konnichian complex. A plaque outlining the correct procedures for preparing utensils and points of which students should be mindful hangs on a suspended wall above the shelves. 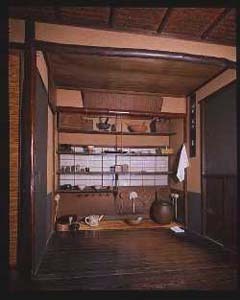 The omizuya, with its layout and placement of tea utensils, is the prototype for all Urasenke preparation rooms.